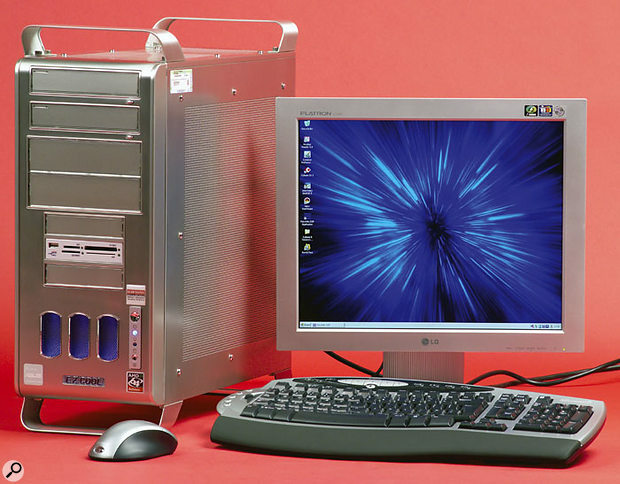 Dawsons Music's AMD Athlon 64-based music computers offer performance comparable to the very fastest Pentium 4 CPUs, and are ready to take advantage of 64-bit software when it becomes available. Inside, the wiring was a model of neatness, and the various cables connected to the Asus K8N-E motherboard had all been dressed and clipped to various points on the chassis for long-term reliability, as well as having the various plugs retained with blobs of silicon to avoid them working free by accident during any journeys. Two sticks of high-quality Corsair RAM had been fitted for a total of 2GB of system memory, and the twin Seagate Barracuda 120GB drives for system and audio duties had been fitted in Silentdrive sleeves to minimise their noise contribution. The top CD bay had been fitted with a 16x speed DVD-ROM drive for reading duties, while the second CD bay held a Pioneer DVR108 DVD burner — the first to offer 16x speeds for both DVD+/-R and 4x speeds on double-layer media for up to 8.5GB of storage, and generally considered one of the best on the market for its wide media compatibility. Dawsons had fitted a versatile Multimedia drive in one of the two 3.5-inch drive bays, supporting seven memory-card formats, although unlike the similar drive fitted to Inta Audio's Opteron PC, this one doesn't provide a slot for floppy disks. I doubt that this will worry many people, and Dawsons are happy to fit a standard floppy drive on request. On the visual side, the Asus graphics card used an nVIDIA GeForce FX5200 chip with passive (non-fan) cooling. This is more than adequate for a musician's PC, providing dual-head support and VGA, S-video and DVI ports. Of the five available PCI slots, only two were filled, one with an 0404 soundcard from Emu, and the other by a Firewire card that offered three extra IEEE 1394 ports on the back panel to supplement the one offered by the motherboard. The supplied Microsoft Wireless Comfort keyboard is the largest I've ever used, so make sure you have plenty of desk space if you specify this model for your system. It features three clusters of extra keys, including transport controls and a 'zoom' slider, but although these are compatible with most Adobe, Corel and Microsoft applications, as usual they stubbornly refused to work with Cubase, which is a great shame. The associated mouse also incorporates a very handy 'tilt' function into its scroll wheel, so you can scroll sideways as well as up and down, but once again this didn't work with Cubase. Case: Suntek 7104H Alpine Silver, with 425W Hiper 3S425 power supply with dual quiet fans and four-position fan speed control. Motherboard: Asus K8N-E Deluxe with one Socket 754 for AMD Athlon 64 processor, NVIDIA nForce 3 250GB chip set running 800MHz system buss, three 184-pin DDR DIMM sockets supporting up to 3GB of PC3200 SDRAM memory, five PCI slots and one AGP 8x/4x slot. Processor: AMD Athlon 64 3700+ (code name Clawhammer) with 2.4GHz clock speed, 1MB cache, includes Hypertransport technology. CPU heatsink and fan: standard AMD, supporting 'Cool & Quiet' technology. System RAM: two 1GB sticks of Corsair PC3200 running at 400MHz. System and audio drives: Seagate Barracuda ST3120026AS, 120GB, 7200rpm, Serial ATA, fitted in Silentdrive sleeves. Graphics card: Asus V9620 GeForce Fx5200, passive cooling and 128MB RAM. Multimedia drive: supporting Compact Flash/Microdrive, SD Memory Card, Multimedia Card, Memory Stick, Smart Media and USB 2.0 formats. Optical drive 1: Pioneer DVR108 DVD-RW/CD-RW burner, 16x DVD+/-R , 4x DVD+/-RW, 4x DVD-DL (double-layer), 32x CD-R, 24x CD-RW, ATAPI Ultra DMA 4 interface, 2MB buffer. Optical drive 2: LG GDR8163B 16x DVD-ROM. Active system ports: PS/2 mouse and keyboard, S/PDIF optical and co-axial, four Firewire ports, serial port, parallel port, five USB 2.0 ports. Keyboard and mouse: Microsoft silver/black OEM wireless key/mouse system V3. Installed operating system: Windows XP Professional Edition with Service Pack 2. LG Flatron L1730P LCD, black/silver, with 17-inch diagonal, 1280 x 1024 native resolution, and Pivot Pro dynamic rotation between portrait and landscape formats. Audio interface: Emu 0404 with version 1.50 drivers. Music software: Steinberg Cubase SX 3.0. A quick peek in the BIOS showed that most of the normal tweaks had been applied, disabling such unwanted motherboard features as Instant Music, Game and MIDI ports, Smart Q-Fan, and RAID support. However, I was surprised to see that the DVD-RW and DVD drives had been connected as Secondary Master and Slave respectively, with the two SATA drives as Third and Fourth IDE Masters — while this lets you attach them both to a single IDE cable, it would seem more sensible to instead have them as Primary Master and Secondary Master. On switching on, almost the only sound I could hear was that of the standard AMD fan/heatsink fitted to the CPU, which was running flat out at 3200rpm. Dawsons had fitted this largely so they could try out AMD's Cool & Quiet Technology, which only works with this heatsink and fan assembly, but are happy to fit a Zalman cooler if customers prefer. I suspect this would be a much quieter option; even after running Prime95 's Torture Test the CPU temperature only rose to 50 degrees Centigrade, suggesting that a much slower fan would still provide sufficient cooling. Subsequently I enabled the Cool & Quiet function in the BIOS, installing the appropriate motherboard drivers and Windows utility, but while the CPU speed ramped smoothly up and down from 1GHz to 2.4GHz on demand, the CPU fan never budged from its maximum speed, and was thus no quieter. However, the alternative approach of enabling the Asus Q-Fan function in the BIOS was more fruitful, and let me reduce CPU fan noise almost to inaudibility. Unfortunately, the two thermostatically controlled fans in the PSU made significantly more noise once the system had warmed up, drowning out the CPU fan. However, the PSU had a four-position fan switch on the PC's back panel, and once I'd changed it from the Automatic temperature-controlled position (as shipped) to permanently Low it was considerably quieter and continued to cool the system perfectly adequately, although if it meets its manufacturer's stated 18dB specification I'll eat my hat! I must admit to being slightly disappointed with the acoustic noise of this system, and although it wouldn't cause problems for those running software studios, it might if you wanted to record with microphones in the same room. However, Dawsons could easily reduce noise levels by fitting a different PSU, and were already sourcing quieter alternatives when I later spoke to them. They are now also offering three further system-silencing options: the Standard pack offers acoustic foam lining and a Zalman CPU cooler for an extra £59.99, the Pro pack has more advanced foam options and includes hard drive enclosures for £99.99, while you can also have a fanless PSU fitted for an extra £139.99. Since this system already has low CPU temperatures, it therefore has the potential to be as quiet if not quieter than anything I've reviewed to date. 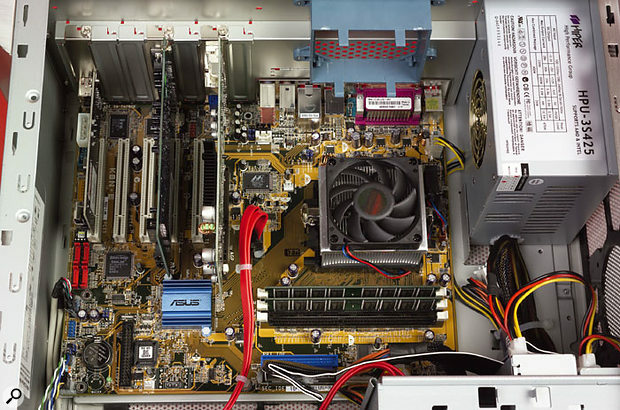 AMD processors have long proved popular with musicians with DIY PC skills, but many specialist music PC builders have avoided them because of possible incompatibilities between the associated chip sets and audio hardware. This situation seems to be changing (even previously staunch Intel supporters Carillon are now offering AMD Opteron systems), although I still do occasionally come across mentions of incompatibilities. Like AMD's Opteron range, the Athlon 64 range can either run in 32-bit mode (for 'legacy' or compatibility purposes) or in true 64-bit mode. Windows XP and all your existing 32-bit software should therefore run quite happily now, but you won't get any of the extra speed benefits of 64-bit addressing until a 64-bit operating system and applications are released, along with 64-bit drivers for all your hardware devices. Although Microsoft have released an evaluation version of their forthcoming Windows XP 64-Bit Edition operating system, and some companies such as M Audio have already developed 64-bit drivers, there's little practical benefit in having a 64-bit-capable processor until XP 64-Bit Edition's commercial release, which is currently projected for late 2005. Just to confuse matters still further, AMD have recently introduced a new range of Athlon 64 processors using the Socket 939 format (939 pins rather than the 754 of the model used in this system). It seems to be generally accepted that the 754-pin version provides equally good performance as the newer 939 format for the same clock speed, as well as being cheaper, which I suspect is why Dawsons chose it for this system. Unfortunately, the latest 3800+ and 4000+ versions of the Athlon 64 have only been made available in Socket 939 format, which suggests that the Socket 754 format may be nearing the end of its useful upgrade potential. So, just as Intel customers must currently choose between the Northwood or Prescott ranges, potential AMD Athlon 64 customers must also make the same choice between lower price and possible greater system longevity. All the usual Windows tweaks had been applied to this system, and I could find nothing to complain about at all in this department. I was also very impressed by the clarity and brightness of the Flatron monitor when set to its native resolution of 1280 x 1024 pixels and using the DVI connection, and especially with its ability to rotate the picture by 90, 180 or 270 degrees. The two 120GB hard drives had been NTFS formatted, with the first split into a 24GB System partition and an 87GB Slave partition for backups and the like, and the other left as a single 112GB volume for audio storage. Dskbench measured 56MB/second sustained transfer rates for both read and write, just like every other system I've tested containing Seagate Barracuda SATA drives. Meanwhile, the Multimedia drive showed up inside Explorer as four separate Removable Disk entries labelled CF, SM, SD and MS, denoting the various card formats on offer. With plug-in and soft-synth performance roughly equal to that of a Prescott 3.2GHz PC, this Athlon 64 3700 system is surprisingly cost-effective. I performed my usual raft of Sisoftware Sandra tests, the CPU Arithmetic Dhrystone and Whetstone measuring 10939 MIPS and 3949 MFLOPS respectively, while the CPU Multimedia results were 22930 it/second and 24753 it/second for integer and floating point. I include these for completeness, since each test result varies so much (some higher, and some lower) from the same test with other processor types such as the Northwood, Opteron and Prescott that it's difficult to draw obvious conclusions. I was, however, surprised by the Athlon 64 memory bandwidth figure — 2.6GB/second was considerably lower than I expected, although I subsequently confirmed that this was in the right ballpark from some other Athlon 64 3700+ system reviews. It is more comparable to Intel Xeon systems at around 3GB/second than P4 or AMD Opteron systems, which achieve about 4.6GB/second and 5.3GB/second respectively. 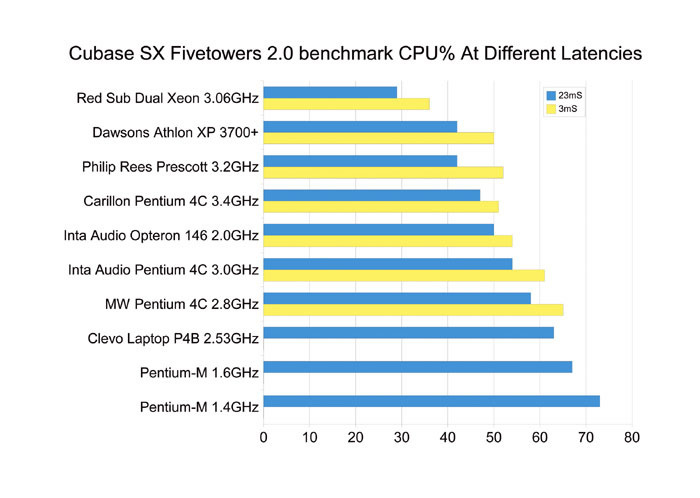 Of course, benchmark results, while useful, are no substitute for trying out real-world software, so my tests were mainly focused on comparing the performance of the AMD Athlon 64 processor to that of Intel's Pentium 4 range when running my usual Cubase SX Fivetowers song to measure plug-in and soft synth overheads. At 20ms latency, the CPU overhead was identical with that of the Philip Rees Prescott 3.2GHz system I reviewed in SOS January 2005, which is extremely impressive for a processor with a 2.4GHz clock speed! At 4ms the results were also very close to the Prescott system, and by extrapolating the fastest Intel Northwood I've measured (the 3.4GHz Carillon system I reviewed in SOS September 2004) I calculate that on this music test at least, the AMD Athlon 64 3700+ would provide performance roughly equivalent to a 3.7GHz Northwood processor, if we could buy one. So, I can finally agree with all those musicians who have already extolled the virtues of the Athlon 64 range — it seems you really can equate AMD's model number (in this case 3700+) with an Intel P4 Northwood processor of roughly similar clock speed, even when running audio applications. What's more, performance should further improve once Microsoft finally release the 64-bit version of Windows XP (see box). You can order Dawsons computers on-line using the web-site PC builder to assemble your own choice of components, or by phone to one of the Dawsons shops. They offer a 12-month guarantee on their PC systems, and during the first three months this also includes all handling charges to and from the workshops should it need to be returned to base. During the latter nine months the customer has to pay to send the system back, although Dawsons will still cover the return courier cost. After this initial 12-month period, they offer a free health check, and are still happy to provide customer advice and any other information that proves necessary. First-line support is via the Hi-tech departments of their many stores, and if there are any problems that can't be resolved by telephone support, their repair system provides second-line support direct to the dedicated computer department within 24 hours. They say that repairs are typically carried out and sent back on the same day. In recent months I've been lucky enough to have three radically different PC systems for review, and the results have been fascinating. Inta Audio's AMD Opteron 146 system was extremely quiet, and its 2.0GHz processor offered plug-in and soft-synth performance roughly equivalent to a Pentium 4C 3.2GHz processor, while the Phil Rees Prescott 3.2GHz Pentium 4 defied expectations by being even quieter and turning in results closer to a P4C 3.4GHz processor, showing that the Prescott is better than many people have claimed, although more expensive to keep cool quietly. However, this Dawsons Athlon 64 3700+ system with its 2.4GHz processor held its own in my tests with the 3.2GHz Prescott despite being considerably cheaper. Part of the reason for its lower price is reflected in the higher level of acoustic noise, but the Athlon 64 seems to be so easy to cool that it wouldn't be difficult to significantly drop the noise level by using a different power supply and one of Dawsons' silencing packs, which wouldn't bump up the price significantly. With plug-in and soft-synth performance for the Athlon 64 3700+ proving roughly equivalent to a P4C 3.7GHz processor, it really makes you question whether paying extra for any Intel Prescott system is worthwhile. Judging by various conversations I've had with specialist music PC builders over the last few months, there do seem to be a few remaining compatibility and reliability concerns with the Athlon 64 range when used with some audio interfaces, but I didn't experience any problems with this system during the review period, and lots of musicians are using such systems in the field with similar success. Overall I have to give this Dawsons Athlon 64 system a definite thumbs-up, although personally I'd forego the fashionable case in favour of a quieter one with a better power supply, and be prepared to pay a little extra — after all, it's very good value for money to start with! Audio performance similar to an Intel P4C (Northwood) 3.7GHz processor. Fitted with both DVD-ROM drive and DVD burner. Good looks and build quality. Noisier PSU and CPU fan than many specialist music PCs. Floppy drive is optional extra. This Dawsons system is very good value for money considering its twin DVD drives, two 120GB hard drives and 2GB of RAM, and the Athlon 64's performance with plug-ins and soft synths is truly excellent. Only acoustic noise levels let it down slightly, and these could easily be improved. Basic system as reviewed without monitor, music hardware or software £1279; basic system but with Athlon 64 3500+ processor £999; full system as reviewed including monitor, Emu 0404 soundcard and Cubase SX 3 software £1999. Prices include VAT. Dawsons Music +44 (0)800 612 1385.